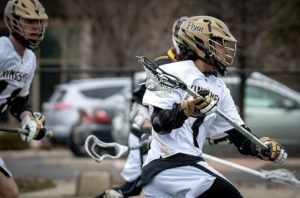 Jackson Lambert fired in seven goals and the Penn Boys Lacrosse Team defeated Fort Wayne Snider, 15-3, on Saturday, April 14. Garrett Deakin contributed three goals to the Kingsmen attack. Kyle Parmater, Pierino Giovannini, and Stephen Urbanski each fired in one goal for the Kingsmen. Owen Bartus led the Kingsmen with three assists, and Karson Warner and Andy Schuring had two assists each. Connor Fisher had five saves with the effort in goal.